At this price, what are the compromises? 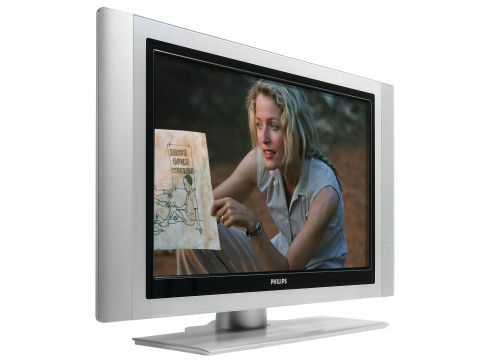 With a price tag of just £800, this 37in screen clearly sits near the bottom of Philips' increasingly wide LCD TV range. But exactly how much of a compromise on performance are you expected to swallow in return for a lower price? The 37PF5521D looks okay in a rather old-fashioned way, although the finish is perfunctory and plasticky. However, connectivity is beyond reproach for an £800 37in TV, with twin HDMI support, a component video input, full connection support for a built-in Freeview tuner, and an SP/DIF digital audio output for shipping on multichannel audio received via the HDMIs. The only connection shortfall is the lack of any dedicated PC jack or the Ethernet connectivity offered by Philips' upscale models. The screen has a native pixel count of 1366 x 768, a claimed contrast ratio (when using a provided Dynamic Contrast function) of 1600:1, and a brightness quoted at 500cd/m2. An Active Control circuit automatically adjusts image parameters in response to an analysis of the incoming video source. There's also Dolby Virtual audio processing, and support for AV input PiP viewing. The set's HDMIs don't support 1080p inputs, however, and there's no version of Philips' Pixel Plus image processing - not even an old one! Overall, I found the 37PF5521D's images a little disappointing. The main reason for this is the set's inability to handle motion. And this applies to both standard- and high-definition material. You don't have to be watching fast action to see it, either; even newsreaders' faces lag as they turn from side to side. Standard-def footage suffers from the lack of any Pixel Plus processing, tending to look rather soft and undetailed. I also felt the TV occasionally exaggerated MPEG noise in digital broadcasts. These core troubles are made all the more unfortunate by the many things the TV does well. The black level is deep enough to deliver a surprisingly authentic sense of scale during the epic space battle that opens The Revenge of the Sith. Generally, dark parts of the picture don't look hollow like they do on many budget rivals. The same scene also looks very crisp - except for when motion is messing things up. Colours during HD viewing are exceptional, combining vibrant saturations with some natural skin tones. Sonically the 37PF5521D is basic. The speakers don't have either the power or the frequency range to rise to the challenge of our Saving Private Ryan test sequence, sounding harsh and thin. They do fare okay with most 'daytime TV' viewing. It may be a Philips best-seller, but motion blur problems rule this out as a serious living room contender.